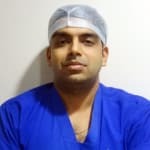 Dr Anurag has done his medical training and specialization from KMC Manipal. After finishing his training he worked in KMC Manipal for over a year before moving out to private practice. He has been associated with many reputed hospitals and his last association was with FMRI Gurgaon. With nearly 5 years of experience, he has special interest in providing comprehensive care for victims of head and spinal trauma. He has acquired skills in the latest minimally invasive techniques of spinal surgery whether it is a routine discectomy or a complex fusion and has performed numerous such surgeries. He is also regularly performing surgeries for brain tumors, pediatric neurosurgical conditions, spinal tumors, cerebrovascular conditions. He has over 10 publications in Indian and international journals. Dr. Anurag Gupta is an experienced Neurosurgeon in New Delhi, Delhi. He has been a successful Neurosurgeon for the last 14 years. He has done MBBS, MS (General Surgery), MCh Neurosurgery. You can meet Dr. Anurag Gupta personally at Fortis Flt Lt Rajan Dhall Hospital in New Delhi, Delhi. Don?t wait in a queue, book an instant appointment online with Dr. Anurag Gupta on Lybrate.com. Good afternoon, I am Dr Lata Bhat, a developmental Pediatrician in Delhi. We take care of developmental disorders in children like Autism, Hyperactivity, ADHD, learning and physical disability. Today I will talk about Autism. Autism is a spectrum disorder that means there is a wide range of presentations. Why did I choose to speak on this topic? The incidents are alarmingly high. It is a sort of epidemic and if not addressed, it can lead to a disaster. The cause is Genetic. If one child has got Autism then the siblings also have the maximum chance to suffer from the same disease. Autism affects the communication of the child. It affects the speech, language as well as the non- verbal communications. Communication is the exchange of thoughts, ideas between the two or more people. Speech is delayed. How do the parents or a care taker suspect the child? Initially, the norms of the communication come first and then the speech. How to get rid of migraine? And what are the symptoms of migraine. How can I avoid this problem. Thanks for expecting healthier fitness solutions with ayurved, stress induced n season trigggered headache may be right or left half of head with or without nausea vomiting, ayurved offers detox n rasayan therapy to longer benefits. My mother is a CVA patient since 2013 June & since then she can't perform day to day activities on her own. She has got paralysis on her left side. Since then physiotherapy was regularly done with her but with no result. So I am asking if there is any medicine to treat her at this stage? Our body is composed of many elements that carry out emotional and physical functions that are usually in sync with one another. It is important for these organs and other elements to be in sync for good health. All nerves are connected to the brain and are responsible for sending important signals throughout your body. Therefore, even one pressed nerve may send you warning signals such as pain to the body. It is advisable not to overlook these signals. Damage from a pressed nerve might be minor or extreme. It might bring about persistent and chronic issues. Therefore, the sooner you get a treatment for nerve compression, the more relieving experience you will have. In a few cases, you cannot reverse the damage caused by a pressed nerve. However, treatment does relieve you from the pain in most cases. If the nerve is pressed between tissues, for example, your tendon, ligament or bone. Nerve compression in your neck or arm may likewise bring pain in zones, for example, your elbow, hand, wrist or fingers. Aggravation or weight on a nerve root leaving the spine may bring about neck or low back pain. In case a disc tears, it is known as a herniated circle that can put weight on a spinal nerve. To what extent you are affected depends from individual to individual. Treatment fluctuates, based upon the seriousness and reason for the pinched nerve. You may find that you benefit from just resting the affected area and by maintaining distance from any exercises that may cause you harm. If side effects endure or torment is serious, it is best to consult specialist. You may require one or more types of treatment to contract swollen tissue around the nerve. NSAIDs - Non steroidal inflammation mitigating drugs (NSAIDs, for example, headache medicine, ibuprofen, or naproxen may diminish swelling). Oral corticosteroids - These are utilized to lessen swelling and agony. Opiates - These are utilized for brief periods to lessen extreme pain. Steroid infusions - These infusions may diminish swelling and allow the affected nerves to recover. Exercise based recuperation - This will extend and reinforce muscles. Brace - A prop or delicate neckline limits movement and permits muscles to rest for brief periods. Interventional Pain Procedures: They are the most cost effective and non invasive methods for pain relief as recommended by the WHO. Your pain will be taken care of by the interventional pain physician or the pain specialist. Surgery - Surgery might be required for more serious issues that do not react to different sorts of treatment. My mother is 40 years old and she has numbness in her both hands near the figures since a day. She has eaten PA12 as a pain reliever. Please suggest something. Do Take Tens Therapy for pain relief for 12 days followed by strengthening exercise from physiotherapist Best wishes. I am 25 years old my problem is migraine so please tell us what can I do and what type of medicine take mi please tell me. Mostly patients have been successfully treated over the years with cupping therapy for headaches and migraines. The treatment has proven to significantly reduce both the severity of pain and the frequency of the headaches. The types of headaches have ranged from unexplained chronic daily headaches to migraines, cluster headaches, tension headaches, sinus type headaches and headaches caused by muscular-skeletal or neck tension. I am suffering from Bell's palsy from the last 4 months. I started medication within 3 days but physiotherapy treatments about 1.5 months after onset. I have recovered but my lower eyelid is droopy and eye feels sensitive to air. Will I recover completely? Please give some suggestions and timing for its recovery. Hi sir, You do tight close and opening of the eye lids in front of mirror daily. your problem will be solved. What I don't use or drink any alcohol then what should be the reason for shivering of hands. Dear Lybrateuser, - Your shivering of hands could be due to weakness of the body or hormonal imbalance - have a well balanced diet with more of green leafy vegetables, fruits, whole grains, milk & milk products, lean meats - do regular exercises like walking, jogging, moderate weight lifting two to three times a week, also do yoga for 5-10 min in the morning to keep your body fit - take a multivitamin capsule daily after breakfast. My wife is suffering from numbness of skin and severe pain in left abdomen and back up to spine. Following tests have been done with out any significant findings: abdomen ct scan - enlarged liver 17%, age related changes seen in lumber region but insignificant. Mri spine - dorsal - normal, slight age related changes abdomen u/s - normal hemogram - normal lipid profile - slight increase in ldl & lower hdl kft - normal urine routine and culture - minor colony of staphylococus thyroid - normal doctors consulted till now do not associate any of diagnostic findings with symptoms and have put her on pregabalin 75 mg nucoxia120 and rabekind dsr. Request advice from concerned specialists on exact cause of her condition and way to diagnose and treat her. She is 52, slight overweight and post menopausal since last two years. Regards. Hi thanks for your query and welcome to lybrate. I am Dr. Akshay from fortis hospital, new delhi. You have mentioned numbness in skin and associated pain. I need to ask and understand since when is she having these symptoms, does she experience pain radiating in legs, any associated numbness in legs, toes etc, any paresthesias (electric shock like sensations, burning, pin prick sensations etc). Please enclose me her mri reports and doctor's prescriptions so that I can also read them and then advise you accordingly. Do not hesitate to contact me if you need any further assistance.